After World War II, the question of how to define a universal human nature took on new urgency. 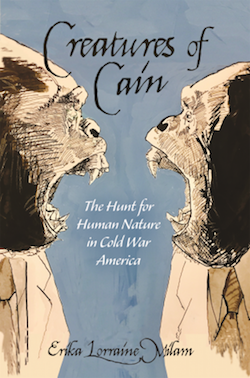 Creatures of Cain charts the rise and precipitous fall in Cold War America of a theory that attributed man’s evolutionary success to his unique capacity for murder. Drawing on a wealth of archival materials and in-depth interviews, Erika Lorraine Milam reveals how the scientists who advanced this “killer ape” theory capitalized on an expanding postwar market in intellectual paperbacks and widespread faith in the power of science to solve humanity’s problems, even to answer the most fundamental questions of human identity. The killer ape theory spread quickly from colloquial science publications to late-night television, classrooms, political debates, and Hollywood films. Behind the scenes, however, scientists were sharply divided, their disagreements centering squarely on questions of race and gender. Then, in the 1970s, the theory unraveled altogether when primatologists discovered that chimpanzees also kill members of their own species. While the discovery brought an end to definitions of human exceptionalism delineated by violence, Milam shows how some evolutionists began to argue for a shared chimpanzee-human history of aggression even as other scientists discredited such theories as sloppy popularizations. A wide-ranging account of a compelling episode in American science, Creatures of Cain argues that the legacy of the killer ape persists today in the conviction that science can resolve the essential dilemmas of human nature. Erika Lorraine Milam is professor of history at Princeton University. She is the author of Looking for a Few Good Males: Female Choice in Evolutionary Biology.